National Monument To The Forefathers (288/365 v2.0) – Annoyingly Boring? 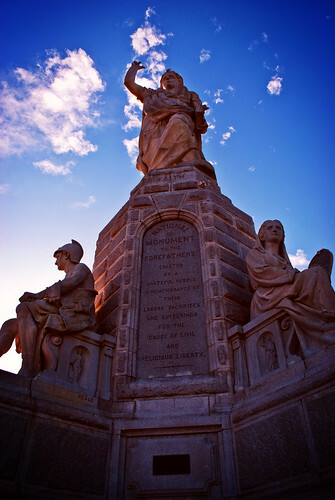 Although not as famous as the Mayflower II or Plymouth Rock, the National Monument to the Forefathers is pretty impressive and worth a look for sightseers visiting Plymouth Massachusetts. I’ve been a resident of the area my entire life but had never checked it out until today. It stands 81 feet tall is fashioned from solid granite and has some pretty impressive sculpture in it. My photo doesn’t really do it justice as I was there at high noon (not a great time for photography). Great sky yesterday, wasn’t it? .-= christine´s last blog ..Atop Turkey Hill =-. This is a very under appreciated landmark. I too haved lived in the area my entire life and when I first saw this imposing monument, just a few years ago, I was taken back by it’s size. Anyone visiting Plymouth should see it. It makes up for all that the sight of Plymouth Rock lacks. .-= stanleyramon´s last blog ..Riley Field Renovations =-.